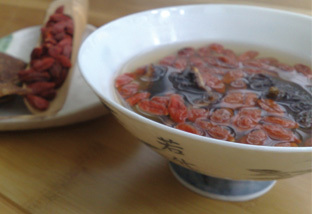 Give some TLC to your throat with this Goji berries and dried orange peels brew. In this third part of Nourishing Oriental Herbal infusions, I will talk about Han-Herbal Brews. Just like Qigong and acupuncture, Han-Herbal brews are part of traditional Chinese Medicine (TCM). Chinese people have relied on TCM for thousands of years to help prevent and cure illnesses. It is very much a part of our lives as TCM is frequently incorporated into the food that we eat. There are about 500 different types of herbs that can be included in the repertoire. Typically, the herbals are used in conjunction with other herbs to create a concoction for a specific ailment. The herbs include various parts of plants (fresh or dried) such as Hawthorn fruit, goji, orange peels, dates, ginger, nutmeg, honeysuckle flower, cassia seeds or cassia bark; they may contain minerals and animal components. The herbs are usually infused, boiled or ground into a powder. Most recipes may include some fruit to add some natural sweetness to the brew. The earliest record of Han-Herbal brews come from the Tang Dynasty’s Arcane Essentials from the Imperial Library (Waitai Miyao). This forms the basis for the Compendium of Materia Medica (written by Li Shizhen in the Ming Dynasty). In the Guangya (a 3rd century encyclopaedia – the earliest recorded in the world), prior to the Xihan era (202BC) the Chinese people collected tea leaves to make into tea cakes (compressed tea leaves). The tea cakes were broken into pieces and then roasted before adding in boiling water together with spring onions, ginger, and mandarin oranges. The brews were consumed as a rejuvenating beverage. Han-Herbal brews are best made using clay and porcelain pots. Try to avoid metallic pots as the tannin might react with the pot and reduce the effects of the herbs. Clay pots that have been baked at very high temperature are best for this type of herbal brew as they emit infrared energy. One could also use a tea bag for holding the herbs during brewing. One might also need a pestle and mortar to break down some of the harder herbs. – Add boiling water to the herbs and infuse for 5 minutes. ** a glass of this slightly acidic tea after each meal can help to stimulate metabolism. – Peel the pomelo and extract the fruit segments. – Bring the pomelo fruit segments, hawthorn fruits and orange peels to a boil. Remove from heat. – Add the green tea and infuse for 3 minutes. Add sugar to taste. ** The combination of fruits and hawthorn fruits can relieve thirst and can help to dispel the effects of alcohol. – Bring all ingredients to a boil and take off heat. – Let infuse for 10 minutes. Drink while still warm. ** The warming (yang) ginseng and ginger rejuvenate and improve blood circulation. No more cold hands and legs! – Bring the water to a boil and add all the ingredients. – Simmer for 5 minutes and remove from heat. – Strain and enjoy the brew. ** The sweet aroma of Osmanthus accompanied by the green tea and lotus leaves is extremely refreshing. This infusion can also help to relieve water retention. – Boil ginkgo nuts with the water till cooked. – Pour the ginkgo nut and the cooking liquid on to a cup with the jasmine flowers. – Infuse for 3-5 minutes. ** This infusion can relieve catarrh and has anti-bacterial properties. – Pour boiling water over the orange peel and goji berries. – Infuse for 5 minutes and enjoy! ** If you have an itchy throat, why not try this brew to provide some TLC to your throat? In part IV of this Nourishing Oriental Herbal infusions series, I will talk about Chinese Teas (Camellia Sinensis).